From Juan Saez's "Liquid Bank" proposal. 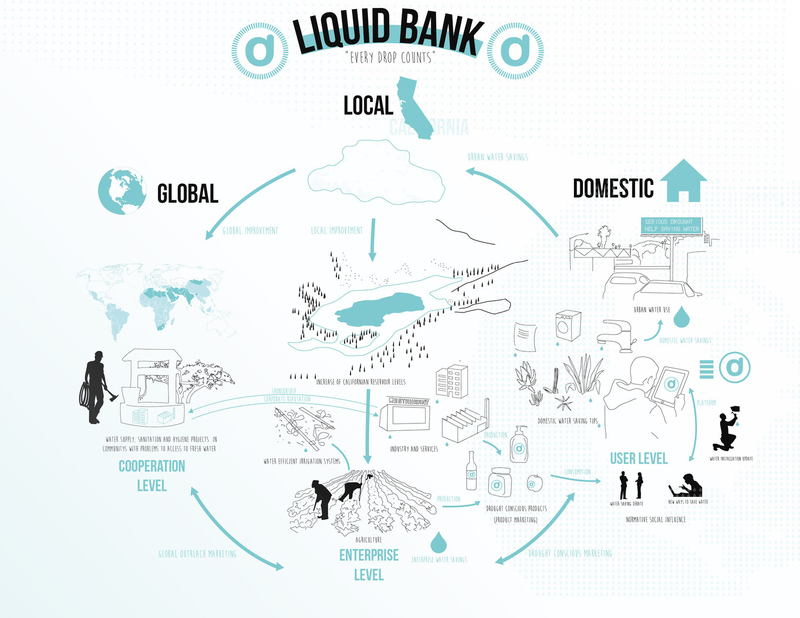 Liquid Bank confronts California’s drought from both a local and global perspective. The project addresses the relationship between domestic water consumption and the global water crisis with the development of water related infrastructure in emerging countries. Ultimately, the project aims to address California’s drought emergency situation by causing a behavioral shift amongst California residents. Liquid Bank is a platform (app and website) that offers a system of rewards and incentives that encourage users to use water responsibly in both their domestic and corporate life. Users sign-up for a profile at LiquidBank.com and begin earning the Liquid Bank’s digital currency, Aquo. Users can earn Aquos through implementing a variety of water-saving habits: installing low flow shower heads or faucet aerators, incorporating container gardening or drought resistant plants, reducing their household water bill or, as an enterprise, developing a plan to improve an office’s water consumption habits. Depending on the water saving impact of the action in gallons per month, a certain amount of Aquos will be added to the users account. As users earn Aquos, they support water-related infrastructure projects in developing countries. Members of the Liquid Bank feel a greater incentive to save water because of the direct ability to be a part of behavioral change, aid the drought, and create global water consumption awareness. Aquos can be exchanged for projects that positively affect water supply and sanitation in developing countries. Users (person or enterprise) can become sponsor water-related humanitarian action. This way, with just one simple action, the Liquid Bank creates change both in simultaneously in developing countries where there is not enough water infrastructure and in California, where water consumption must be reduced. In order to fund a project using Aquos, a project must have a large amount (something that is difficult to achieve by a single user). In this circumstance, users can share info about Liquid Bank and their project, and collaborate to fundraise Aquos and achieve their goal together. The amount of users will grow spontaneously and quickly through word of mouth. 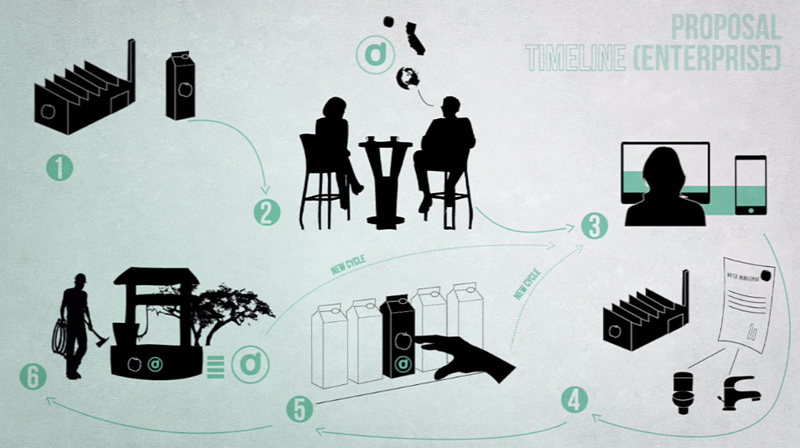 As the Liquid Bank gains more and more users, its social influence and relevance increases. 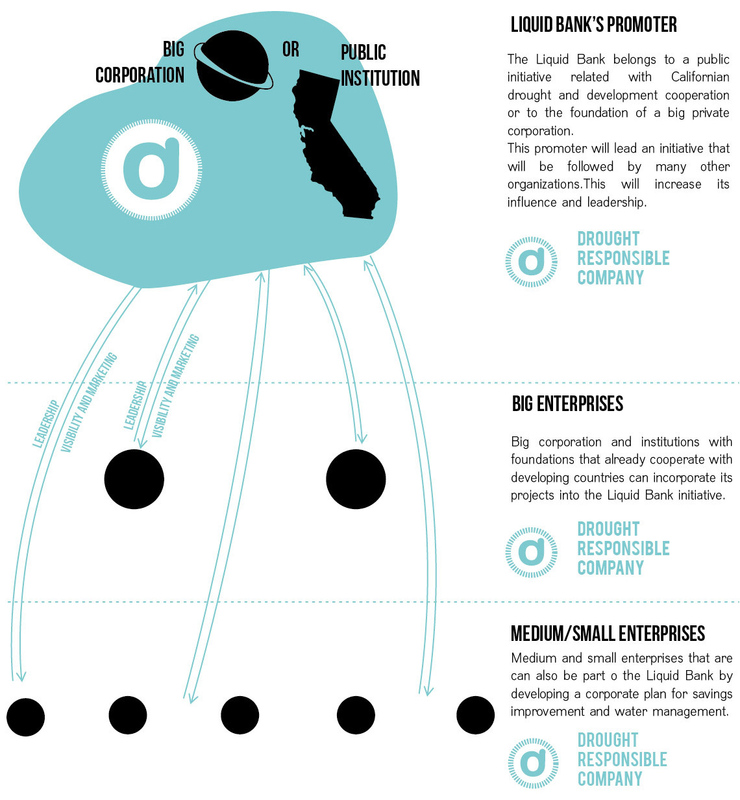 Corporations want to collaborate and be a part of the Liquid Bank in order to acquire a Liquid Bank stamp, a way for costumers to recognize them as a drought responsible company or organization. 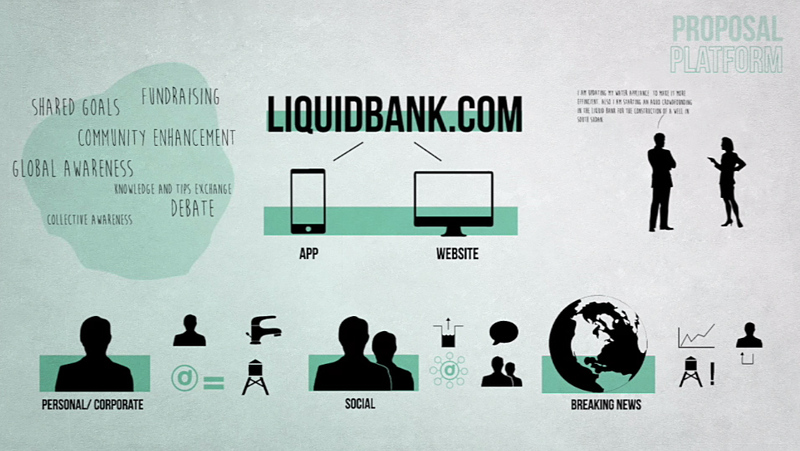 Check out the image gallery for Liquid Bank's complete presentation.